‘The Portfolio Pianist’ Not so very long ago, the advice for young musicians, in preparation for a life of music-making, was to specialise. To develop a unique selling point, an individual was to carve out a niche within a niche. Nowadays, for the aspiring musician, flexibility and a willingness to engage with all areas of performing and teaching is highly prized. Someone who has developed confidence in all aspects of their work, through experimentation and learning as well as a positive outlook, is a far more attractive proposition for a potential employer in these difficult times for the performing musician. So, what does this mean for the young pianist? Long gone are the days of pianism being restricted to the solitary practice of a recital programme then the solo tour to follow. For each of the very few virtuosi that sell out venues the world over, there is an army of pianists working, often unseen, as teachers, as coaches, as accompanists, as orchestral musicians and conductors, and as collaborative artists in the world of opera and ballet. Pianists can be found in every school, whether playing for assembly on a Monday morning or playing for exams and auditions. In nearly every university, playing for choir practice and for final recitals in the Music Department. At conservatoire, staff pianists play a crucial role in the running of the Vocal School as well as playing for all faculties, Drama included. Repetiteur work is a hugely demanding job, requiring excellent language skills, and is pivotal to the success of an operatic production. Piano players work as assistants to conductors, to music directors and choreographers and are vital to the production of broadcasts and staged shows. The list is never-ending and, for any pianist who is willing to embrace this multitude of opportunity, it is a joy. Share your experience! Please tag us on social media. Winner of the BBC Scottish Young Jazz Musician of the Year at only 17, and Berklee College of Music’s prestigious Billboard Award, pianist/composer Alan Benzie is one of the UK’s most exciting talents. He is joined by friends and long-time collaborators Andrew Robb on bass (BBC Scottish Young Jazz Musician of the Year 2009; Bass Europe Competition Winner 2018) and Marton Juhasz on drums (Foundation for Hungarian Percussion Culture Award 2010; “Drummer of the Year” 2014 and 2015, JazzMa readers’ poll). Iain Burnside is a pianist who has appeared in recital with many of the world’s leading singers (“pretty much ideal” BBC Music Magazine). He is also an insightful programmer with an instinct for the telling juxtaposition. His recordings straddle an exuberantly eclectic repertoire ranging from Beethoven and Schubert to the cutting edge, as in the Gramophone Award-winning NMC Songbook. Recent recordings include the complete Rachmaninov songs (Delphian) with seven outstanding Russian artists (“the results are electrifying” Daily Telegraph). Burnside’s passion for English Song is reflected in acclaimed CDs of Britten, Finzi, Ireland, Butterworth and Vaughan Williams, many with baritone Roderick Williams. Away from the piano Burnside is active as a writer and broadcaster. As presenter of BBC R3’s Voices he won a Sony Radio Award. For Guildhall School of Music & Drama Burnside has devised a number of singular theatre pieces. A Soldier and a Maker, based on the life of Ivor Gurney, was performed at the Barbican Centre and the Cheltenham Festival, and later broadcast by BBC R3 on Armistice Day. His latest project Swansong has been premiered at the Kilkenny Festival. Their debut album “Traveller’s Tales” and 2018 release “Little Mysteries” have both garnered glowing reviews, with “Little Mysteries” also winning Best Album in the 2018 Scottish Jazz Awards. They have been delighting audiences throughout the UK and Europe over the last few years, including at London International Jazz Festival and United Europe Jazz Festival, as well as being the featured artists on BBC Radio 3’s “Jazz Line-Up”, Austrian National Radio and BBC Scotland’s “The Jazz House” and “Jazz Nights”. The music is rooted in European and American jazz, but is influenced by impressionist piano music and film music, and Benzie’s love of Japanese animation gives a visual, storytelling quality. From sensitive, magical textures to virtuosic explosions of energy, the trio are both sophisticated and accessible, with the warmth, empathy and interplay that can only be achieved through great friendship and years of making music together. Recent highlights include performances of the three Schubert songcycles with Roderick Williams at Wigmore Hall. A Delphian release of songs by Nikolai Medtner launched a major series of Russian Song in the 2018 Wigmore Hall season. Other forthcoming projects feature Ailish Tynan, Rosa Feola, Andrew Watts, Robin Tritschler and Benjamin Appl. Iain Burnside is Artistic Director of the Ludlow English Song Weekend and Artistic Consultant to Grange Park Opera. he studied with Richard Beauchamp at St. Mary’s Music School in Edinburgh and Renna Kellaway at the Royal Northern College of Music in Manchester. He is a Visiting Professor at the Royal Academy of Music and was elected a Fellow of the Royal Society of Edinburgh in March 2014.
of a newly commissioned Concerto for Two Pianos by the composer Matthew Hindson with the Sydney Symphony Orchestra conducted by Vladimir Ashkenazy. Recently chairman of the Geneva Piano competition, Pascal Rogé is also dedicated to teaching and gives regular masterclasses in France, Japan, United States and the United Kingdom. Simon Smith Simon Smith was born in Northumberland, England in 1983. At St Mary’s Music School in Edinburgh he studied piano with Richard Beauchamp and composition with Tom David Wilson. In Cambridge he studied composition with Jeremy Thurlow and Giles Swayne. As a pianist he has performed many of the landmarks of the 20th-century repertoire, most notably the piano concerto and complete Etudes of György Ligeti, following a performance of which he was described as “a phenomenon – nothing daunts him, technically or musically” (The Scotsman). For Delphian Records he has recorded solo music by James MacMillan, Stuart MacRae, Hafliði Hallgrímsson and Thomas Wilson. A two-disc set of the complete piano music of Alfred Schnittke, released in 2013, was acclaimed as “compelling and utterly persuasive” (BBC Music Magazine) and praised for its “extraordinary sensitivity, detail and emotional commitment” (The Independent). A disc of piano music by Valentin Silvestrov was released in November 2015. A specialist in music notation, Simon also works professionally as an editor and music engraver, having produced scores for Boosey & Hawkes of numerous large-scale works by Harrison Birtwistle, James MacMillan and others. In recent years he has concentrated increasingly on the music of Stockhausen. For the Stockhausen-Verlaghe has produced new editions of Mantra for two pianos and the ten-player Soloists’ Version of Michaels Reise. He was invited to take part as synthesizer player in the first performances of this version of Michaels Reise in 25 years at the 2015 Stockhausen Courses Kürten, where he was also awarded first prize for his interpretation of Klavierstück XII. Susan Tomes Susan Tomes has won numerous international awards as a pianist, both on the concert platform and in the recording studio, including the 2013 Cobbett Medal for distinguished service to chamber music. She grew up in Edinburgh and was the first woman to take a degree in music at King’s College, Cambridge. Her career encompasses solo, duo and chamber playing; she has been at the heart of the internationally admired ensembles Domus, the Gaudier Ensemble, and the Florestan Trio, winners of a Royal Philharmonic Society Award. She has made over fifty CDs, many of which have become benchmark recordings. In addition to her performing career, Susan gives masterclasses, serves on competition juries across Europe and is on the faculty of the European Chamber Music Academy and of ChamberStudio in London. Her lecture-recitals – most recently on Beethoven, Schubert and Schumann piano works – enable her audiences to engage with the great classics on a new level. She has gained recognition as a cultural commentator and has been a guest on the flagship BBC radio programmes ‘Woman’s Hour’, ‘Today’, and ‘Front Row’. Susan is the author of four acclaimed books about performance: Beyond the Notes (2004), A Musician’s Alphabet (2006), Out of Silence (2010), and Sleeping in Temples (2014). The books are studied on many ‘performance practice’ courses around the English-speaking world. Her fifth book, Speaking the Piano (recollections of learning and teaching) was published in June 2018 and earned a five-star review (‘a gem on every page’) from BBC Music Magazine. Her appeal to a diverse readership was demonstrated by her appearance at the 2016 Edinburgh International Book Festival, which attracted a sell-out audience. Last year, The Scotsman gave her Queen’s Hall solo recital a five-star review: ‘She distils the essence of a piece of music into its purest form in the most profound and moving way.’ Susan is the artistic director and pianist of Winterplay, a mini-festival of chamber music at the Queen’s Hall in Edinburgh. Roderick Williams OBE Roderick Williams encompasses a wide repertoire, from baroque to contemporary music, in the opera house, on the concert platform and in recital. He won the Singer of the Year Award in the 2016 Royal Philharmonic Society Awards and was awarded the OBE for services to music in June 2017.
concert performances with many of the world’s leading orchestras and ensembles. He is also an accomplished recital artist who can be heard at venues and festivals including Wigmore Hall, Kings Place, LSO St Luke’s, the Perth Concert Hall, Oxford Lieder Festival, London Song Festival, the Musikverein, Vienna, the Concertgebouw, Amsterdam and on Radio 3, where he has participated in Iain Burnside’s Voices programme. allowing the exploration of the vast array of ensemble repertoire. Jazz Piano lessons are offered as are Harpsichord and Organ lessons. The faculty hosts concerts each term at the Edinburgh Society of Musicians and pianists play regularly at external events around the country. Pianists also perform in the School’s own concerts of a wide range of music, including classical, jazz and traditional, in venues including the Queen’s Hall, Greyfriars Kirk, St Mary’s Cathedral and the Jam House. Strong links with the Royal Northern College of Music (RNCM) and universities such as Edinburgh and St Andrews give regular opportunities for pianists to be involved in chamber music events nationally as well as in Edinburgh. The School hosts regular trips to hear some of the world’s finest exponents. Masterclasses, talks, concerts and individual lessons are given by eminent visiting musicians throughout the year. Recent visitors have included Andrew Ball, Joseph Long, Leon McCawley, Steven Osborne, Martin Roscoe, Simon Smith, Susan Tomes, Danny Driver and Iain Burnside. Regular visitors Steven Osborne and Simon Smith are former pupils, as too are pianists Alan Benzie, David Gray, James Clapperton, Christopher Guild, David Horne and Sarah Park, to mention just a few. Practice Supervisors are often on hand to help with all musical matters. A weekly Alexander Technique lesson is also offered. There are strong links with many orchestras and ensembles who routinely bring their music to our city. Indeed, we have many active partnerships, performance and accompaniment opportunities, visits and masterclasses all the way through the year. The School also owns three harpsichords and a threemanual Collins Organ. Edinburgh has one of the UK’s richest collections of organs, both old and new. St Cecilia’s Hall is an incredibly valuable collection of early keyboard instruments. Nearby Edinburgh Society of Musicians has two new Steinway Model B pianos (and also a harpsichord) for our use. 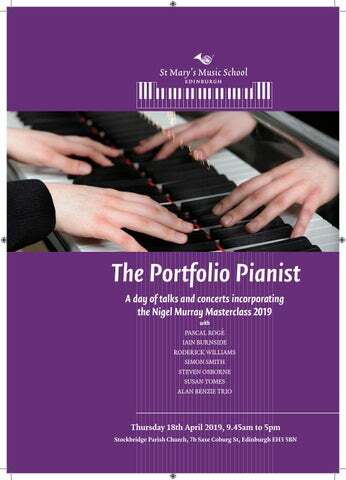 Pupils are formally assessed on technical matters, performance recitals and presentation throughout their time at St Mary’s Music School, except in their final year when the focus shifts to conservatoire/university auditions and public performance. Pupils participate in competitions, local, national and international and take ABRSM exams to gain experience and as a measure of progress. Our pupils have gained considerable success in high profile contests such as the BBC Young Musician of the Year and the BBC Jazz and Folk Awards, along with the former Moray Piano Competition and the James Waterhouse Piano Competition. Performance Classes Designed to act as a stepping stone between rehearsal and public concert-giving, weekly Performance Classes offer a safe space for our pupils to work on presentation and performance anxiety. Allowing platform skills to be honed in front of a small, friendly audience of pupils (between 5 and 10), the class is facilitated by an experienced tutor/performer. Those pupils acting as audience members are encouraged to develop their critical appraisal and share their experiences by way of supportive commentary. Playing to your colleagues, all of whom have a unique insight and understanding of the potential difficulties involved in performing is an invaluable resource and one with which undergraduates at the leading music colleges will be familiar. Coaching Every instrumentalist from S1 upward is assigned an accompanist to take care of all performance requirements. From Performance Classes to televised broadcasts as well as auditions, assessments and exams, the accompanist will follow a pupil’s progress throughout. In addition, weekly coaching sessions are timetabled throughout the school year where this performing relationship can be nurtured. Simply put, coaching is the supportive guidance of a pupil toward a performance, fostering a partnership where ideas flow back and forward, with a view to creating a performance state where freedoms are encouraged. The aim is to help clarify and strengthen a pupil’s musical vision. On the way we work on rehearsal techniques, establishing tempi, leading and a fuller understanding of the score and the others’ parts. Our coaches also act as an extra set of ears, alert to blemish, inaccuracy and uncertainty. The sessions boost confidence and help to give a more rounded version of a chosen work. Through discussion, experimentation, observation and musical response, a pupil will be able to fashion a complete performance that is entirely their ‘own’. Composition Composition is studied and encouraged throughout the School and is overseen and taught by Tom David Wilson and Rob Hall. From P5 to S2 it forms part of pupils’ curricular activities and part of their Theory Classes and is encouraged by the Director of Music, an avid composer himself. Additionally, there are two Composition Clubs for S1 and S2 instrumentalists which prove to be very popular. From S3 and upwards, pupils have class composition lessons as training for their folio submissions for Cambridge IGCSE, SQA Advanced Higher and Cambridge Pre-U courses. Pupils may also take composition as an “Instrument” or specialism, either as a first or subsidiary study. In these cases, a First Study Composer will have an hour’s lesson once a week and a Subsidiary Study Composer would have a half-hour’s lesson once a week. For the various compulsory folio submissions, pupils are allocated a “recording date” in the second term when at least one of their compositions will be rehearsed and recorded. For specialist composers there is a composers’ concert during our Contemporary Music Week and composers are encouraged to arrange their own concerts at other times, both internally and externally. There are many opportunities for the performance of pupils’ work and pupils often enter various composition competitions outwith school. The Meadow’s Chamber Orchestra Composition Competition is a regular opportunity and many of our pupils have been successful here over many years. We also run our own internal competition, the Isobel Dunlop, for which eminent composers are asked to adjudicate. For 2019 this competition will involve Alexander McCall Smith who will provide a text for setting and will help judge the competition. Over the last several years, composition at St Mary’s has grown from strength to strength. Pupils who have gone on to establish themselves as successful composers include David Horne, John de Simone, Alistair Spratt, Neil T. Smith, Lliam Paterson and Helen Grime. The Piano Postcard Competition, instigated by our Tutor of Composition, Tom David Wilson, was open to all pupils at St Mary’s Music School. The brief was simple - submit a piano miniature able to fit on a single sheet of A5 paper. There were over 20 submissions and pianist and composer Simon Smith chose Finn Mannion’s ‘Tuesday’ to receive its première today. Chamber Music “Chamber music feeds the soul” Chamber music is a central part of life at St Mary’s and is an important part of the training we provide. As well as offering a huge and wonderful repertoire, chamber music also provides a platform for selfexpression, collaboration, cooperation, flexibility of thinking, support of others; a shared passion. Chamber music nurtures individualism within collectivism. It is telling that so many of the great composers wrote extensively for chamber groups (the repertoire truly is astonishing) and felt that this represented the pinnacle of their art. When the world’s finest musicians take time off from their busy schedules performing concertos, they get together to play quartets and quintets! Hard-working orchestral musicians give up their precious spare time to play together in ad hoc groups just for the fun of it. Why is this? Perhaps because there is something really special about making music with other people, and chamber music seems to be the very essence of this idea. At its best a chamber group functions like a wellordered society providing stimulation, challenge and reward in almost equal measure; it also encourages a broad range of transferable skills both socially and musically and therefore demands a high priority in the life of any musician. Jazz education has been part of school life for almost thirty years and plays an important role in the evolution of each studentâ&#x20AC;&#x2122;s musical development. The application of harmony, rhythm, transcription and improvisation leads pupils to develop a creative toolkit that can be applied to any genre of music. Jazz piano is taught in school by Chick Lyall and Rob Hall. Co-ordinated by prize-winning bassist and former pupil, Andrew Robb, regular Jazz Days throughout the year help the students understand the benefit of being able to improvise. The benefits are not just musical and are often seen outside of the classroom in areas like organisation, teamwork/leadership skills, problem solving and empathy with their peers. Invest in a Musical Future The Portfolio Pianist is a free event for pianists of all ages. This extensive masterclass would not have been possible without generous support from Gavin Gemmell and the Nigel Murray legacy. Nigel Murray was Director of Music at St Mary’s Music School from 1980 – 1996. After studying violin and conducting in London, Europe and St Petersburg, he played with many of the UK’s most prestigious orchestras before travelling north to become one of the most talented and admired musicians in Scotland. Upon his death he left a substantial legacy to St Mary’s Music School to be invested to fund a series of masterclasses for the benefit of St Mary’s pupils. We are delighted that we can now extend the benefits of his generosity by inviting participants from schools across Scotland. 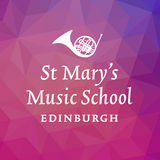 Invest in a Musical Future The great majority of pupils at St Mary’s Music School benefit from means-tested bursaries, funded by the Scottish Government and through regular donations by our supporters. Last year 96% of our families received financial support for fees with 16% receiving 100% fee support. You can help St Mary’s Music School play a pivotal role by helping us deliver the finest music and academic education to exceptional young instrumentalists and choristers. These young people go on to be the dynamic force of music making around the world, performing in orchestras, ensembles, jazz and contemporary groups and inspiring the next generation through teaching. To ensure that the school is accessible to all musically talented young musicians, irrespective of financial means, please consider making a donation to the Bursary Fund or becoming a Friend. Leaving a Legacy Bequests and legacies have been instrumental in the development of St Mary’s Music School since its foundation. They have helped to provide bursaries, the purchase of instruments, support for masterclasses, and enabled the move in 1995 to our current campus on Grosvenor Crescent. If you believe in the importance of investing in St Mary’s Music School’s musical future and share our ethos of access to excellence, please consider a gift in your Will.